With the Andes Mountains as a backdrop, one of South America’s undeniable attractions is its spectacular landscape, which produces some of the world’s best wines. This 7-day trip will expose you to the best of Chile’s wine country on two wheels! This custom-designed program includes moderate biking on paved and unpaved roads through the best of Chile’s wine country. Pedal at your own pace down country back roads, past farms and rolling hills and even take a spin right through rows of vines laden with grapes. After a short ride from Santiago you will begin your biking adventure in beautiful farm country near the coast. We will pass by old ranches and open pastures on the winding road that is lined by native hardwood trees. There are a few short climbs on these rolling hills before we arrive to Las Dichas for a traditional Chilean lunch. Continue on to Algarrobo where you will spend the night at The Winery Hotel. Set out climbing from Algarrobo on this hilly, rural road where we will pass by grazing cattle and sheep, as well as many local producers of cheese, honey, and jams. Arrive to Kingston Family Vineyards for a tour and tasting followed by lunch overlooking the vineyard. Next, you’ll pedal through the back roads of the San Geronimo Hacienda and arrive to Matetic Winery in the San Antonio Valley, where you will spend the next two nights in their beautiful historic hotel. Today you’ll enjoy a tour and tasting at the Matetic Winery, a state-of-the-art winemaking facility designed to complement its beautiful natural surroundings. Grapes are handpicked and carefully examined to ensure only those of highest quality are used in the winemaking process. After a delicious lunch at Matetic, you’ll ride a loop around part of the breathtaking San Antonio Valley – some of the best cycling in Chile’s Central Valley. You’ll access the private farmlands of the Rosario Valley which belong to the Matetic. This is a fun route with stretches of dirt roads and the chance to explore the property’s antique winery, Coralillo. We will pack up the van and depart from the hotel this morning along what is commonly known as the “Ruta de Fruta” (Fruit Highway) for its bountiful crops. After a short while, we will unload and you will bike along this gorgeous route. After a picnic lunch, you will continue your ride over the rolling countryside of the coastal plains until you reach Matanzas and the beachside Surazo hotel. After a pick-up at Surazo hotel, you will bike on route to Residencia Historica, stopping for lunch at Donde Yoli. This local restaurant specializes in traditional Chilean food and has a very authentic atmosphere. After this gastronomic experience you will be dropped off at Residencia Historica. Heading out of Residencia Historica and the town of Marchihue this morning, we will ride east along mostly flat roads toward Estampa for a tour and tasting. With a rich history dating back over a century, Estampa is the first winery in Chile dedicated to ensemblaje (blend) wines. Their Del Viento Sauvignon Blanc blend does particularly well, in local and international media, and was included in a tasting piece by British wine writer Jancis Robinson. The winery was designed by local architect Claudio Blanco, and features a swooping, avant-garde design, which houses cutting-edge winemaking equipment. Since 2015, they have been experimenting with 17 additional Italian. Afterwards we will bike along the same route to Viu Manent for a delicious wine-paired lunch. Viu Manet was founded in 1935 by the Viu family. Viu Manent wines have won several awards, including Gold Medal distinction at the 2011 Catador W Santiago Wine Awards for their Gran Reserva Malbec (2010), Secreto de Viu Manent Sauvignon Blanc (2011), and Secreto de Viu Manent Syrah (2010). Then, hop back on your bike to the sub-valley of Apalta, where we find Neyen. This winery was founded on the site of one of the region’s oldest wineries, with construction and vines dating back to 1890, original Bordeaux stock, in the Apalta valley. Their old vines have deep roots, and require no irrigation. 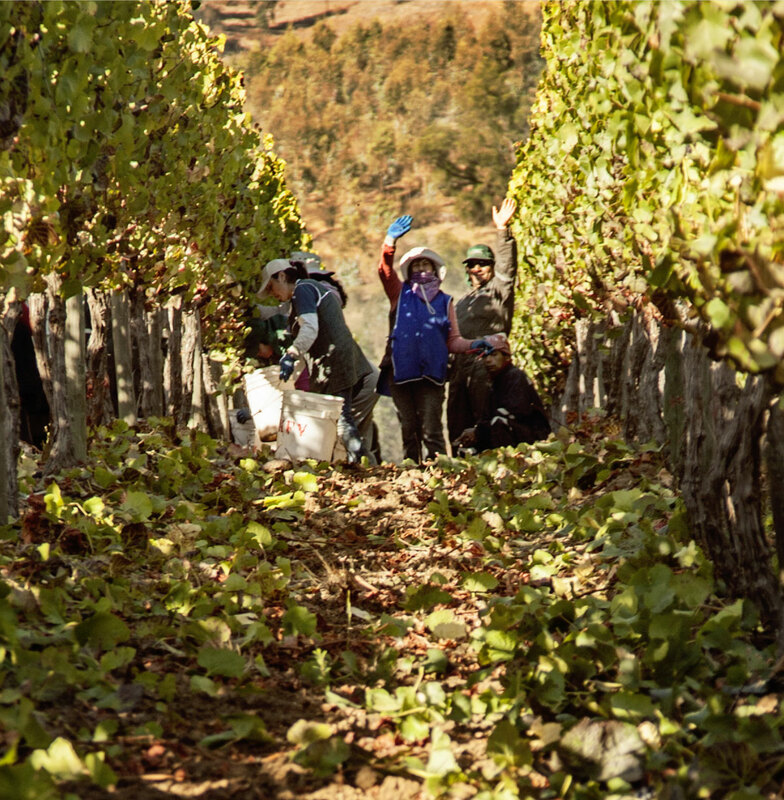 Winemakers take a hands-off approach to the grapes, until it is time to harvest. Their blend consists of Carménère, which they believe gives it structure, and the Cabernet Sauvignon, which adds vibrancy. Spend the night at the Noi Blend Colchagua hotel. Departing from Noi Blend Colchagua we will head to MontGras, which was founded in the mid-1990s by brothers Eduardo and Hernán Gras and their business partner Cristián Hartwig. This winery produces eight different brands of wine across three different valleys: Colchagua, Maipo and Leyda, representing different microclimates. Then we will pass through the small pueblo of El Huique, once the center of the vast Echenique hacienda that stretched from the Andes to the Pacific. Continuing north we will pass through the heart of the valley’s agricultural region passing endless fields of fruits and vegetables. The small towns of San Roberto and Lamarhue are mostly unchanged from the tranquil agricultural life of centuries past. One of the highlights along the route are the 17 waterwheels or “Azudas” that are considered a national historic monument. Built in the 19th century, these wheels are still functioning and move water from the canal to the irrigation system. Turning south we will head into the Millahue Valley which is an indigenous word for “gold.” This is the place where Alexander Vik has built a spectacular winery where he hopes to produce South America’s first 100 point wine. We will enjoy lunch as well as a tour and tasting before departing for Santiago in the late afternoon. The Winery Hotel promises an elite experience, from a poolside view of the ocean to the boutique hotel’s underground wine cellar. The wine Honesty Bar houses more than 100 exclusive wine labels from the Casablanca Valley, all of which can be accessed by guests, and the hotel offers tours of surrounding wineries in the valley for a fee. This chic hotel is located in the coastal town of Algarrobo, where many aristocratic Chileans often vacationed because of the area’s natural beauty and tranquility. The Winery Hotel is ideally located close to the beaches and city center, and features 13 modern suites (free WiFi in all), a Pilates studio, a pool, hot tub, restaurant, and an unparalleled experience in luxury. Built in the early 1900s, the beautiful casona at Matetic is characteristic of the typical Chilean countryside of colonial times. The casona, located on the vineyard property, offers seven spacious and elegantly decorated rooms. Be sure to take time to relax poolside in the lovely outdoor garden area. Matetic also features its own, on-property restaurant, Equilibrio, which is open for lunch Tuesday through Sunday. Noted as one of 2013’s best new hotels by Condé Nast Traveler, Surazo is an excellent beachfront hotel with a truly privileged view of the sea. The hotel was entirely reconstructed in 2010 after Chile’s major earthquake and is back in full force. The beaches are known for their black sand and for excellent surfing conditions (surfing classes and trips are available along with kayak, windsurfing, and stand-up paddle rentals). The rooms are very comfortable, and the hotel is home to a restaurant staffed by professional chefs trained in the French school of cooking. The flavors are always fresh. It’s the perfect place to relax and enjoy the best of the Chilean coast. This charming hacienda is a comfortable colonial retreat just outside of the town of Marchigue and about 40 minutes from Santa Cruz and the Valley of Colchagua. With 20 tastefully decorated rooms, open air patios, spa services, an outdoor pool, and the tranquility of the countryside all around, Residencia Historica is a great place to enjoy all that the Colchagua Valley has to offer. NOI Blend Colchagua, situated 6 km from Santa Cruz, is a part of the high level hotel chain NOI, with locations in San Pedro de Atacama, Patagonia, and much more. NOI Blend, originally a wine bodega, has been transformed into a stylish, urban chic hotel, priding itself on tranquility and the perfect place to relax. Each cozy room is unique in style, making your experience feel personalized and special. Enjoy your time next to the seasonal outdoor pool or outdoor restaurant with views of the garden. Apart from the hotel itself, there are a variety of activities to be enjoyed both on and off-site. Activities include wine tours, cycling, hiking and horse riding. NOI Blend is the perfect place to begin your excursions and end your adventure-filled day in an oasis of relaxation.